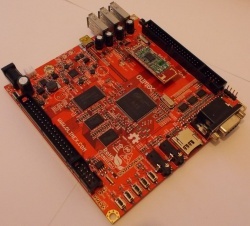 The A13-Olinuxino was the first Allwinner based development board made by Olimex. Like all Olimex hardware, it is fully Open Source Hardware. It says "A13-OLinuXino" on the top. It just doesn't get easier than that! For building u-boot, use the "A13-OLinuXino" target. Use the sun5i-a13-olinuxino.dts device-tree file for the mainline kernel. The Home button triggers FEL mode. Warning, while you can boot this board at 5V it really is preferable to boot this board at 6V. For instance, enabling the backlight on the 7" LCD module will immediately hardlock the board at 5V, while at 6V it is perfectly stable. 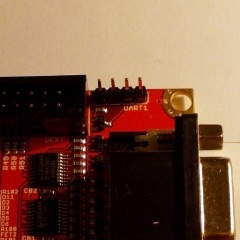 Even though the A13 does not provide DACs itself, the A13-Olinuxino has a VGA connector. This is implemented through 3 separate DAC chips (NXP LVC244A) which are connected to the LCD0 lines. This in turn means that you cannot use an LCD and a VGA monitor at the same time, but this is ok as the A13 can only drive one display at a time anyway. Due to the bandwidth limitations of the A13 SoC, the best resolution you can hope for is 800x600. You can attach several Olimex LCD modules to the LCD connector (LCD_CON). A UEXT connector. This is meant for attaching Olimex UEXT modules. A 10 pin IO connector (GPIO-1). A 40 pin IO connector (GPIO-2). The earlier revisions of the A13-OLinuXino (Revisions A and B) had a separate UART1 connector which shared lines with the SD connector. You had to use the UART lines on the UEXT connector, to be able to use an SD card as well as serial. From revision C onwards, there is the unpopulated UART0 connector, which shares those same lines with the SD Card lines. There is also a populated UART1 connector, which is standalone. For a connector pin-out, the easiest way is to refer to the pin descriptions on the back of the board. Simply attach your leads according to our UART howto. There are no rebadgers for this type of device. Olimex A13-OLinuXino-Micro: a cut-down, cheaper version of this board. Olimex github repository with all CAD files and schematics. This page was last modified on 23 November 2016, at 03:25.